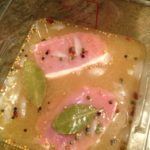 In a plastic container put the kosher salt, brown sugar, coriander, peppercorns, mustard powder, bay leaves. Juice the citrus and and mix with the vinegar. Heat for 2 minutes in a microwave or on the stove top until it begins to simmer. Add the vinegar citrus mixture to the spices and swirl to dissolve. Let mixture sit for 5 to 10 minutes to develop flavor. When ready to grill, rinse the pork chops, score each side slightly and grill as you like to desired doneness.